I’ve been eating a lot of sandwiches lately. I mix up the toppings to try to keep it interesting: Turkey or ham, tomatoes or onions… But I almost always use a little wedge of spreadable cheese. First, because I love cheese and I think a sandwich just isn’t the same without it. And second, because this little cheese wedge is only 35 calories and also lets me skip the butter/mayo I would want to spread on my bread. I got to thinking, since I like this spread cheese so much on my sandwiches, what about baking it into my bread…? I didn’t think the flavor would come through well if I just mixed it into the dough, so I decided to make a simple dough and make a swirl bread instead. So I found a recipe on Taste of Home and decided to adapt the fillings to see if it would work. The bread is moist with a crisp crust, and the filling remained pretty well intact. The flavor of the cheese is noticeable, but not as much as when you spread it on a slice of bread. A slice does come apart a bit when I cut it, so I think this would be a little difficult to make a sandwich with. It would go great with some soup or pasta to dip it in! In a large bowl, dissolve yeast in 3/4 cup warm water. Add sugar; let stand for 5 minutes. Add the whole wheat flour, salt and remaining water; beat until smooth. Stir in enough bread flour to form a soft dough (dough will be sticky). Turn onto a floured surface; knead until smooth and elastic, about 6-8 minutes. Place in a bowl coated with cooking spray; turn once to coat top. Cover and let rise in a warm place until doubled, about 1 hour. Punch dough down and turn onto a floured surface; divide in half. Roll each piece into a 14-in. x 9-in. rectangle. Brush with some of the egg; refrigerate rest of egg. Spread half of the cheese over each dough to within 1/2 in. of edges. Roll up jelly-roll style, starting with a short side; pinch seams to seal and tuck ends under. Place seam side down in two 9-in. x 5-in. 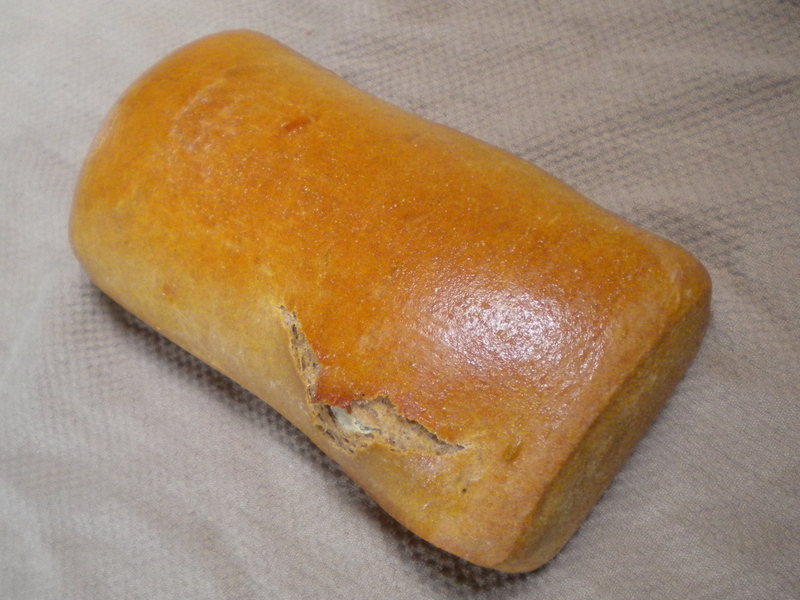 loaf pans coated with cooking spray. Cover; let rise until doubled, about 45 minutes. Brush with reserved egg. Bake at 375° for 40-50 minutes or until bread sounds hollow when tapped. Remove from pans to wire racks. Makes 2 loaves (12 slices each). My loaves both turned out pretty well, just a little split in the top of each one where the dough was rolled a little too thin. I will make this one again for a side dish, but am still looking for different recipes to play with for sandwiches. Do you have a favorite sandwich bread?